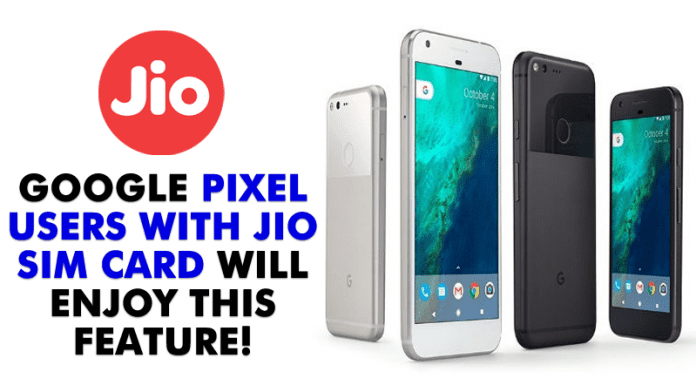 Google Pixel Users With Jio SIM Will Enjoy This Feature! Technology Android Google Pixel Users With Jio SIM Will Enjoy This Feature! Google Pixel and Pixel XL users will soon get the next Android Nougat update and the update will bring some exciting new features to Pixel and Pixel Xl smartphone. Users can make calls using WiFi. Well, 3 months ago Google released the first test version of the latest version of Android Nougat and it was already released and running on official Google devices. Google India is now all set to roll out the next major Android nougat update for Pixel and Pixel XL smartphone. So, Google Pixel and Pixel XL users will soon get the next Android Nougat update and the update will bring some exciting new features to Pixel and Pixel Xl smartphone. Users can make calls using WiFi. Google India tweeted “Now say Hi over Wi-Fi. VoLTE and WiFi calling, now available to Pixel on Jio. Watch out for the next Nougat update”. That simply means that users who have Jio number and are using Google Pixel or Pixel XL can make calls even in areas with poor cellular network connectivity. Users can make use of the Wi-Fi calling feature only when they have a jio sim inserted in their Google Pixel or Pixel XL smartphones. Well, the feature will not only reach Pixel and Pixel XL smartphones, it will also reach devices like Nexus 5X, Nexus 6P, Pixel C and Nexus Player. If we talk about Jio Sim card. Reliance jio had just introduced two new plans under Jio Dhan Dhana Dhan offer. For best offers visit this link. So, what do you think about this? Share your views in the comment box below.